Today, with over 152 billion blogs inhabiting the content landscape, it’s almost impossible for a small business to stand out of the crowd. The best method for leading new audiences to a website that doesn’t require a huge marketing budget is attracting organic traffic. High rankings on Google SERPs (search engine results pages) do not happen overnight and require hard work of improving the search engine optimization of every single piece of content. The surefire way to win the competition for high SERP rankings is to use the right content optimization tools. These (mostly free) tools help to find the right keywords and take a blog article from the graveyard of forgotten content to the first page of Google search results, leading more traffic to your company’s website. After finding a suitable topic for a blog article and before starting to write it, successful content marketers conduct a quick research to find relevant keywords. Google Keyword Planner helps to find subject-related keywords and gives an overview of their monthly search rate and keyword difficulty (how competitive a keyword is). For blogs that do not yet have a broad readership, the best practice is to find keywords with under 1000 monthly searches and low to medium competition. If you want to cover a widely popular topic with highly competitive keywords, use long-term keywords that are more specific, but less difficult to rank high for. After finding 1-3 keywords that could potentially lead people to your article, move on to making your article worthy to appear in top ten SERPs. Buzzsumo is a freemium tool that helps publishers find the most-shared content on specific topics. It is also highly beneficial when gathering ideas to write a detailed piece on a certain subject. By typing pre-defined keywords to Buzzsumo, content creators can discover other popular articles on related subjects. By reading the articles, you can learn what angles of a topic interest your potential audience the most. Moreover, these articles serve as a useful resource for new ideas and subjects to include to your own content. Make sure to read at least three popular articles on the topic you’re about to write about. You’ll get invaluable insight about what triggers the audience to share an article, and learn from the best resources to be in the know when compiling your own piece of content. To rank high in search engine results, your content needs to be helpful and profound, meaning that it has to be the very best resource for learning about a certain topic. Many content marketers use the skyscraper technique to create high-ranking content. The skyscraper method means gathering information from all the existing articles covering a topic you’re about to write about. The end goal is to make your guide or article even more detailed and helpful than the current top-rankers. Google Search is the best resource for gathering high-quality information and implementing skyscraper technique, as all your competitor’s high-ranking content is laid out in the open. 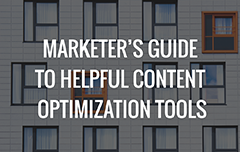 This content optimization tool enters the game after a new piece of content has been written and published. Moz On-Page Grader evaluates how well a web page is optimized for a specific keyword. It’s a super easy-to-use tool – all you have to do is to enter a keyword and a link to the webpage, and you’ll get a grade for your page optimization alongside suggestions for improving the SEO. Don’t accept an on-page ranking of under 95 points (out of 100). Keep fixing the SEO problems and don’t forget to use an SEO plugin for WordPress, add the metadata and insert your primary keyword to article’s headline and image alt tags. Alright… Now you should be all set and can have a huge cup of coffee while Google does all the ranking for you. Sorry, just kidding. This was just the beginning. After publishing a well-optimized piece of content, the hard work to get the keywords ranking high on SERPs only begins. You can significantly increase your search engine rankings by adding link to your new piece of content inside previously published blog posts and vice versa. By interlinking articles on related topics, you show Google that you have a lot of valuable information on a specific subject that will benefit the readers. For this purpose, the best tool for content optimization is the Google Sheets where you can store information about all your published content, categorized by topics and keywords. Take an extra step and create a Google Sheet with the names of all your published articles, complemented with the keyword data. This spreadsheet will help you avoid using the exact same keyword phrase in the headlines of multiple articles. You’ll attract a wider audience by targeting slightly modified keywords in every article covering a similar topic. After publishing the content and checking its optimization score with Moz On-Page Grader, marketers need a tool to keep their eye on the SERP rankings of their web pages. By adding targeted keywords to Moz, you can get weekly reports on the rankings of all your targeted keywords. Take notice that usually, pages may take up to two weeks to appear in Google’s search results. If a certain keyword starts to appear high on SERPs, you might want to boost its ranking by adding more links to the page inside other content on your website, and improving the article by adding even more relevant and helpful information. Moz recently released a new Related Topics feature for page optimization that helps to find related keywords and topics that publishers might want to include in their content (or in upcoming articles). By checking the related topics, content marketers can gather new ideas to create complementary content, leading to higher SERP rankings. By now, you should have a clear overview of the basic content optimization tools that help to identify the right keywords, create optimized content, and boost its rankings even after the publication. Remember that Google doesn’t praise web pages only for clever SEO. To rank high, you need to create content that’s detailed, relevant, and answers the queries of the people searching for the particular keywords used in your blog articles. Here’s the Golden Rule: create content that’s both meaningful and SEO-optimized, and you’ll soon see your web pages appear in the top ten of Google’s search results. Karola Karlson is the Content Marketing Manager in Scoro, the business management platform for agile companies. Her passion for superior writing combined with strategic thinking make her focus all her energy on becoming a successful digital marketer and creative writer. For more on Karola, find her on Medium and connect to her on Twitter @KarolaKarlson.